This describes the durability and athleticism found in my original Morgans; individuals rich in the “Western Working Family” lines through such horses as Sparfield and Keystone. In an effort to produce more individuals with the quality and heart of my first Morgans, I have gathered mares of western ranch lines, mostly from old California stock. 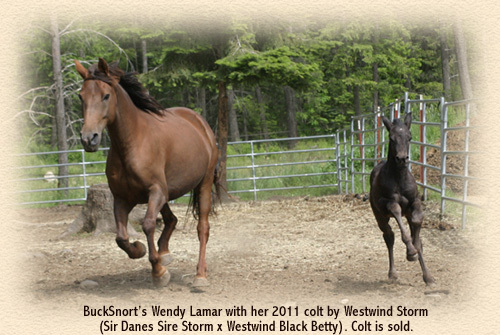 These mares have my beloved Sparfield in their pedigrees, along with other complementary western lines. These lines have been tested over time on ranches, in reining and in cutting events. 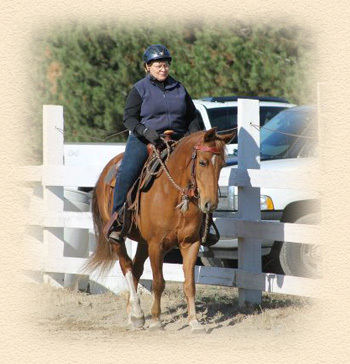 The proven athletic ability bred into these horses also makes them ideal for eventing, dressage, endurance and trail riding. 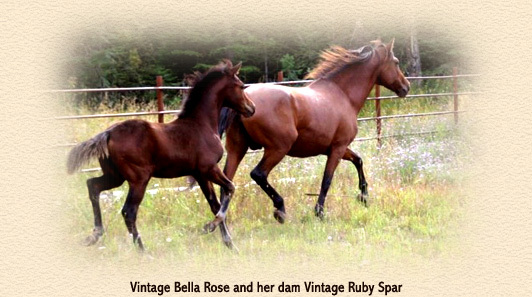 Due to their unique bloodlines, these mares are also excellent breeding stock with an important role in continuing the western working heritage. I feel very fortunate to have Wendy in my program. She is tall and has a very sweet disposition. 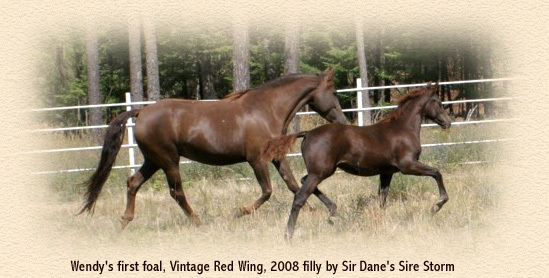 and will be retaining Red Wing for our breeding program. These two full sisters are daughters of Looking Good (Sparfield x Shawalla Tocinka) with a sireline through Sparbeau to Linsley. Looking Good is also the sire of TK Booshawlay, a successful Morgan reiner. 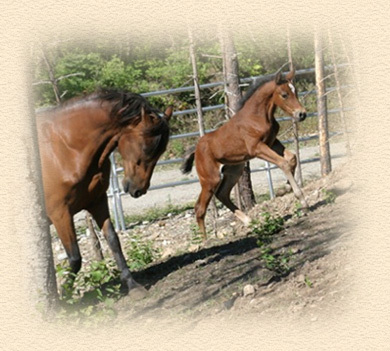 Their dam, Genou Rosita Margarita (Triple S Red Cedar x Tia Margarita), is a full sister to Montana Harvest (1996 Res. Grand Nat’l Reining Champion with many other reining awards) and a maternal half sister to Primavera Valdez (also a proven reiner) and Brass Buckle. Tia Margarita is known as an exceptional producer as is her dam, Gay Berta. This is a very strong mare line. Although smaller and more slender in build than the Vining Lamar daughters, these sisters have cat-like athletic ability and are very efficient movers. With their movement and work ethic, they will excel in cattle work as well as endurance events. 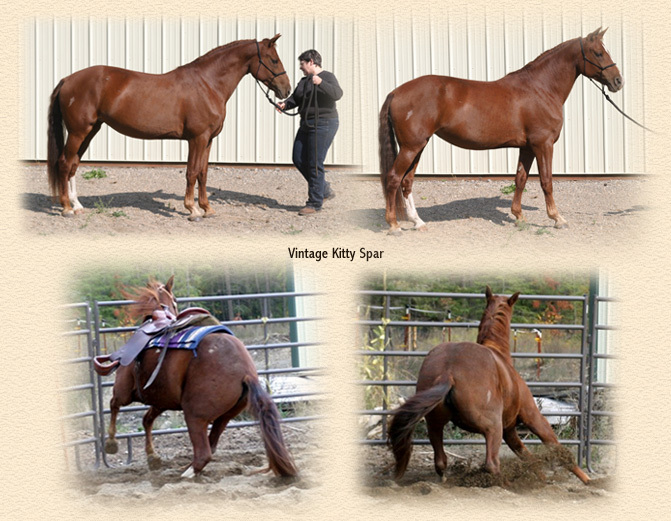 Toy Story has produced two fillies by Sir Danes Sire Storm, Vintage Kitty Spar and Vintage Lusita. 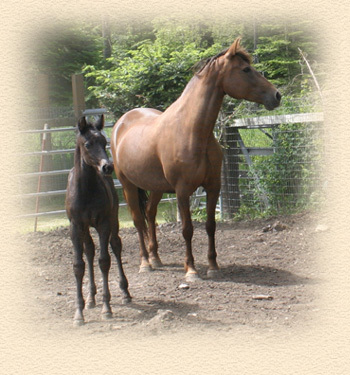 Update: Ruby had a bay filly by Sumrsnow Majestic on May 21, 2008. See Vintage Bella Rose below. The following young mares are being retained for the Vintage breeding program. Kitty is linebred to Sparfield, having him as her great grandsire three times. True to her pedigree, Kitty is a talented athlete with fluid, springy gaits and lightening quickness. 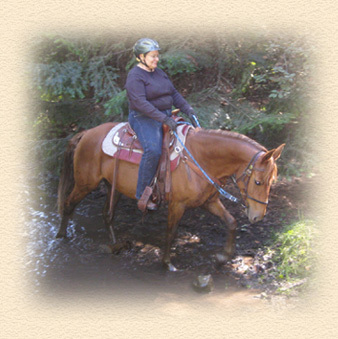 She loves to work and has started her training as a trail horse. Kitty turned out so nicely that we decided to do the cross again. Lusita (better known as LuLu) has balanced movement and a very sweet disposition. This exquisite bay filly is our first cross of the Sparfield-bred mares with Sumrsnow Majestic (see him on the Stallions page). You can be sure we will be doing this cross again!